University of Chicago Press, 9780226500669, 239pp. Maclean grew up in the western Rocky Mountains in the first decades of the twentieth century. As a young man he worked many summers in logging camps and for the United States Forest Service. The two novellas and short story in this collection are based on his own experiences--the experiences of a young man who found that life was only a step from art in its structures and beauty. The beauty he found was in reality, and so he leaves a careful record of what it was like to work in the woods when it was still a world of horse and hand and foot, without power saws, "cats," or four-wheel drives. 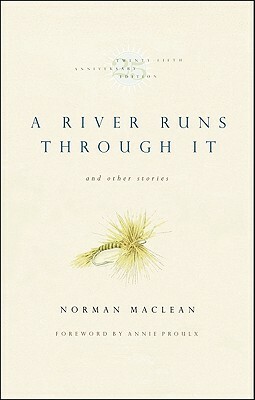 Populated with drunks, loggers, card sharks, and whores, and set in the small towns and surrounding trout streams and mountains of western Montana, the stories concern themselves with the complexities of fly fishing, logging, fighting forest fires, playing cribbage, and being a husband, a son, and a father. Norman Maclean (1902-1990), woodsman, scholar, teacher, and storyteller, grew up in the Western Rocky Mountains of Montana and worked for many years in logging camps and for the United States Forestry Service before beginning his academic career. He was the William Rainey Harper Professor of English at the University of Chicago until 1973.